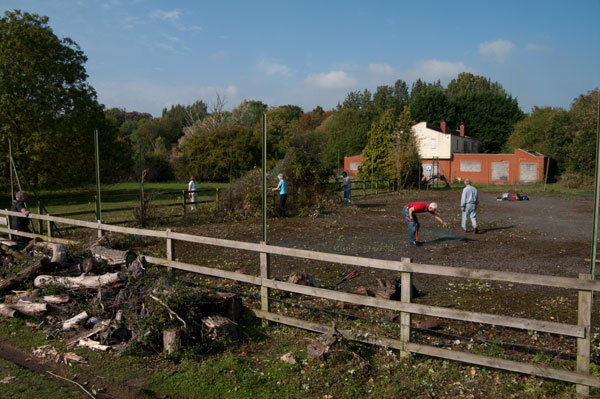 A selection of photographs taken of the fifth Community Work Day, organised by the Northmoor Trust, at Thrupp Lake. The weather on Friday 8th October got off to a dull start, but temperatures were mild. By late morning the clouds started to part heralding an afternoon of glorious warm sunshine, an aftertaste of high summer and ideal weather for doing a bit of clearance work by the lake. 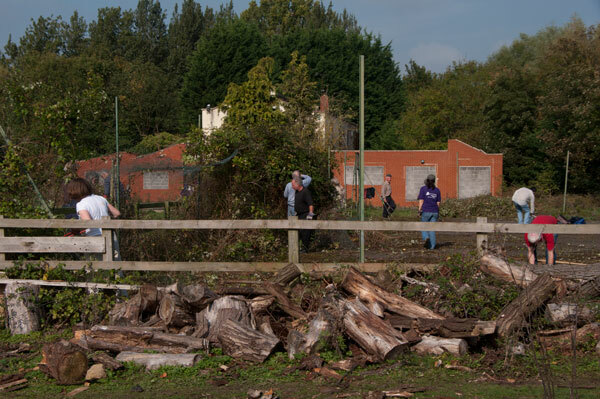 The job facing us today, our biggest task yet, was to remove a 2 – 3 metre wall of brambles and chainlink fence enclosing the Sandles tennis court on two sides. 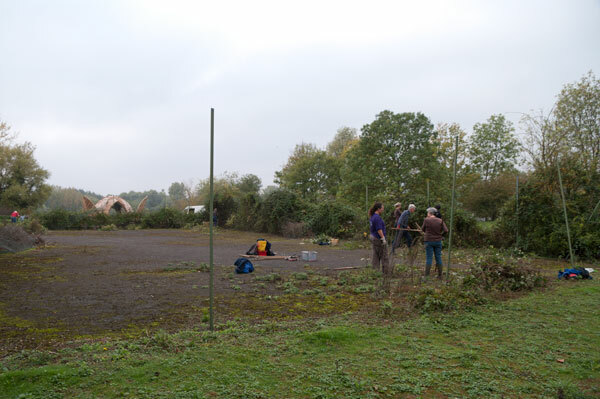 This is the task that had been started briefly in April, but which had had to be abandoned because of nesting birds. 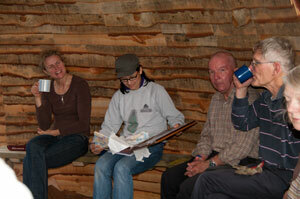 Notice the shelter, now nearing completion, partially visible in the background. A formidable task. 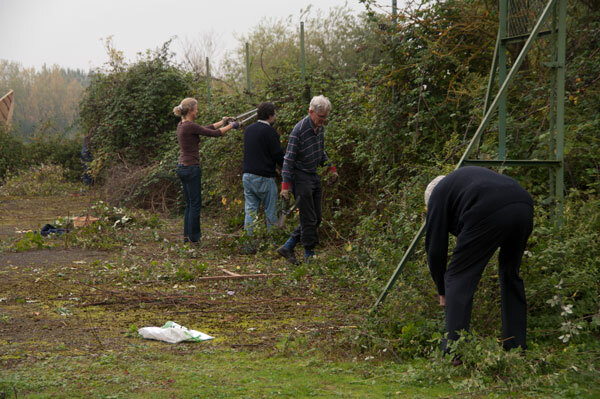 Undaunted, the little band of volunteers present at the start of the day got to work.. Tea break, and a first look at the interior of the shelter – a surreal experience… Strangely, it feels a whole lot bigger on the inside than it looks on the outside. 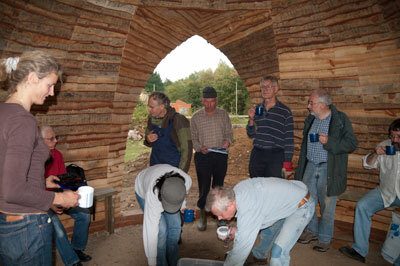 Afterwards, work continued apace as many more people turned up to help. 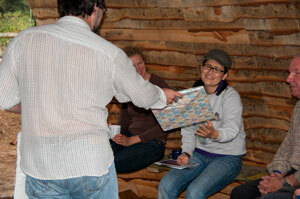 What had looked at the beginning as an impossible task now looked as if was actually going to get finished. 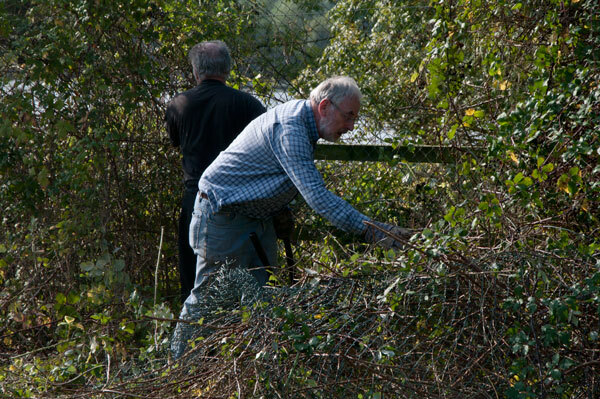 Tackling a 3 metre high bramble bush entangled with chainlink fencing is no mean feat. 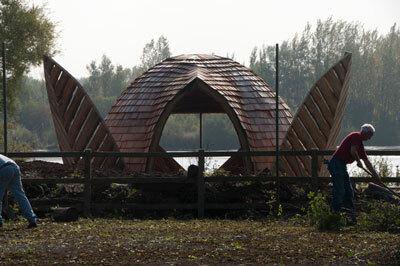 As the brambles were cleared away, the shelter was fully revealed in its setting overlooking the lake. 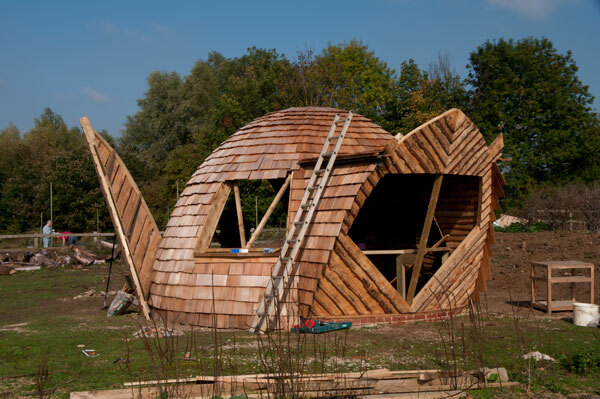 This unique structure is more a work of art than a utility building and certainly not like anything you will find down at the local garden centre! And inside, the view is even more fabulous. 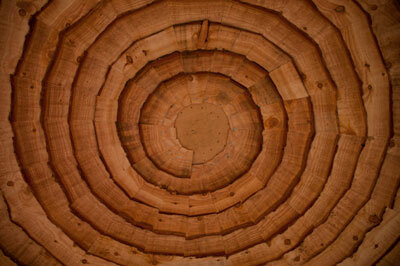 This is the larchlap ceiling and overall the impression is of being inside something in the realm of fantasy. 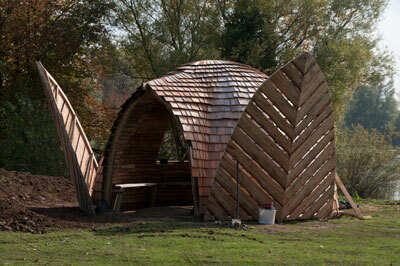 The shelter, showing the viewing window overlooking the lake. 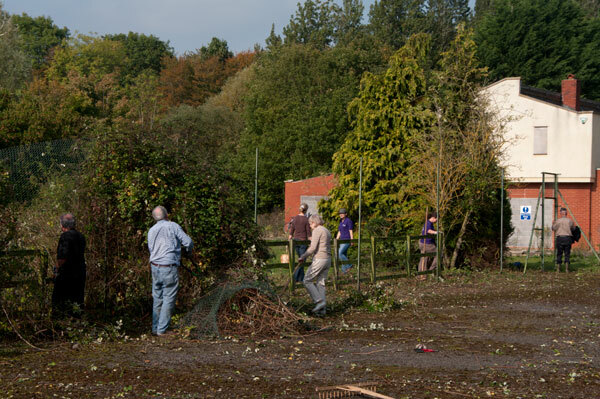 As the day wore on, the brambles gradually disappeared as the space was reclaimed. Swans galore. 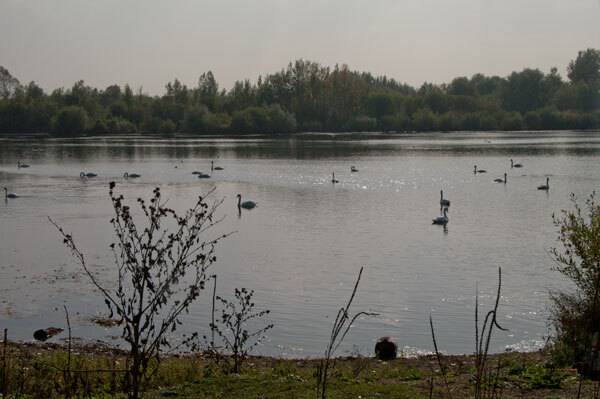 There seemed to be more swans on the lake than anything else today. This large flotilla passed by the site during lunchtime. 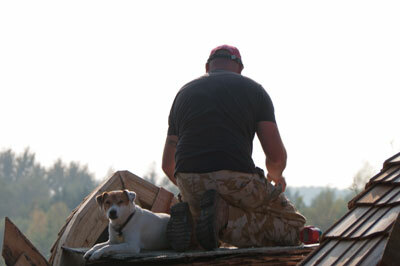 One man and his dog, at work on the roof of the shelter. 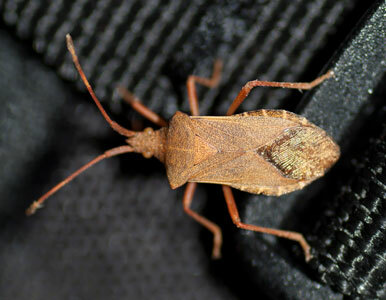 This is the famous Red Data Book 1 Box Bug, that, until about 1990, was found in Britain exclusively in the immediate vicinity of Box Hill in Surrey. After centuries of this confined existence, which made it one of the rarest creatures in the country, at about that time, it inexplicably decided to branch out into new territories (and diets) and it is now turning up over all of Southern England where it has been found on variety of plants, including hawthorn, buckthorn, yew and plum, as well as its original host plant, Box (Buxus sempervirens). It was first seen in Radley in 2008, and has been recorded every year since then. This one was found and photographed inside the shelter, where it was found wandering over a bag apparently looking for somewhere to hide.